On the evening of July 26, 1952, all went quiet over the entire Argentina. Radio transmissions were interrupted by an important message to the nation, who was in shock: Eva Peron, the great “spiritual leader” of the nation, had passed away. When Evita’s lifeless body was exposed, lines of people in tears, who wanted to pay their last tribute, were expanding for more than 2 kilometers from the Casa Rosada presidential palace. The funeral had more than 2 million people attending. 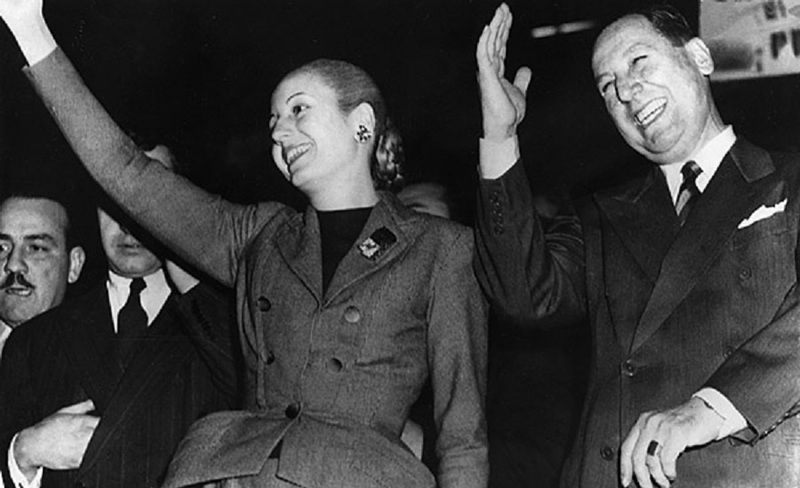 For her husband, President Juan Peron, Evita’s death at only 33 years old was not only a personal loss, but also political loss, as they jointly built a strong popular support, although it was a dictatorial system. Without her, he became vulnerable. Three years later, he lost power in Argentina, being forced to leave the country and retire to Spain. Juan Peron was born on October 8, 1895 and belonged to a middle class family. At age 16, he joined the army, where he was placed in the infantry (as the cavalry only allowed young men from fine families). In 1929, officer Peron married Aurelia, a teacher. The marriage was childless, and after 8 years she died of cancer. Peron continued with his military career. He distinguished himself by his leadership skills and his intellectual endowments. As a result, in 1938 he was sent to Europe as a military observer. In Italy he became an admirer of fascist leader Mussolini, whose leadership and political ideology will become an important source of inspiration for him. At that time, Argentina was facing political unrest and many internal tensions that led to the event of 1943: the civilian government was overthrown by a group of officers. Perón, who had now risen through the ranks and was colonel, planned and conducted the coup. Under the new regime, he was appointed minister of health and labor and it was in this role that he met actress Eva Duarte. In January 1944, the city of San Juan in the Argentine mountain range Andes was hit by a terrible earthquake. In that context, Peron handled several charity events, to raise funds for flood victims. One of the celebrities who were invited to shed their luster over the event was Eva Duarte. Many legendary stories have arisen around the couple. Legendary stories about love at first sight and how the two moved together just a day after they met. And Eva would never depart from his side. The actress was born on May 7, 1919, in the village of Los Toldos, in The Pampas, where her mother worked as a cook girl for a wealthy landowner, Juan Duarte. The fact that Duarte was married was not an obstacle to his total of five children with his beautiful maid. When Eva was seven, his father died in a car accident. Neither she nor his brothers or mother were invited to the funeral. This incident must have left deep traces and spawned a strong desire for revenge in Eva’s heart. When Eva was 16, she moved to Buenos Aires, determined to build a successful career as an actress. But success came after some tough years. When she met Perón, she was 26 years old and already had gained fame due to her roles in radio soap operas. However, according to the gossip, she had achieved this position by using the influence of some powerful men. In the conservative society of Buenos Aires, love affairs between upper-class politicians and actresses were completely outrageous. In people’s eyes, acting was about on the same level as prostitution. But Peron didn’t care about what people were saying. His political target was Argentina’s working class and, in this regard, Evita’s life story was an advantage. After the military coup, all free trade unions were prohibited. Perón organized rather state-controlled unions instead, in order to improve economic and social conditions of workers. Perón quickly became hugely popular among the workers, whose interests had never before taken seriously by those in power. Reforms, on the other hand, were by no means appreciated by the members of the military junta which belonged to the old aristocracy. Peron’s opponents were also very irritated by his public appearances. He openly appeared with his mistress, nay involved her is his work and projects. Eva Duarte benefited from an increasing number of privileges. Her radio salary increased substantially for supporting a fervent propaganda for the future president and his policies; moreover, several of her close friends got important positions in the administration. Junta’s dissatisfaction reached the breaking point in October 1945, when they deposed Juan Perón and threw him in prison. Incarceration caused massive street protests, strikes and demonstrations, in favor of the imprisoned minister. According to many sources, was Eva Duarte one of those who led these protests. The popular discontent was so massive, that the military had to release Perón. On October 22, he married Eva, and the following year he became president of Argentina. Eva abandoned his acting career, dedicating herself to the role of kingdom’s first lady and defender of the poor. She even founded an organization that was collecting large amounts of money. Revenues were then distributed to those in need as Evita ordered. The foundation built hospitals, orphanages and schools, but also distributed clothes, shoes and food. The foundation was supported and financed by the tax system, but trade unions, companies or private individuals were also encouraged to contribute. Organizations that do not voluntarily contributed to the increase of funds could be subjected to reprisals, in the form of confiscated licenses or suspension of electricity. People in need were constantly welcomed in Evita’s office and soon, everyone knew someone who had received something from the foundation: a hospital discount, a sewing machine etc. The people were now worshipping the one who became a symbol of the new regime in Argentina. Even after she was diagnosed with uterine cancer (cervical cancer), Eva continued his philanthropic work, and on May 1, 1952, she gave a final performance at the Casa Rosada, where, on a balcony, she shouted that she always be close to the people. Two months later, Juan lost his most devoted supporter of the regime.